Over the past few weeks, I’ve enjoyed getting our back yard ready for patio dining, entertaining and some Sunday afternoon relaxing. Although the weather hasn’t always been cooperative, I have managed to get most of the planting done for the year, as well as a few other projects I’ll be sharing in the coming weeks. I am thrilled to be part of the Outdoor Extravaganza and was super impressed with the Plants & Flowers Projects that were linked up last week. Did you take a look yet? 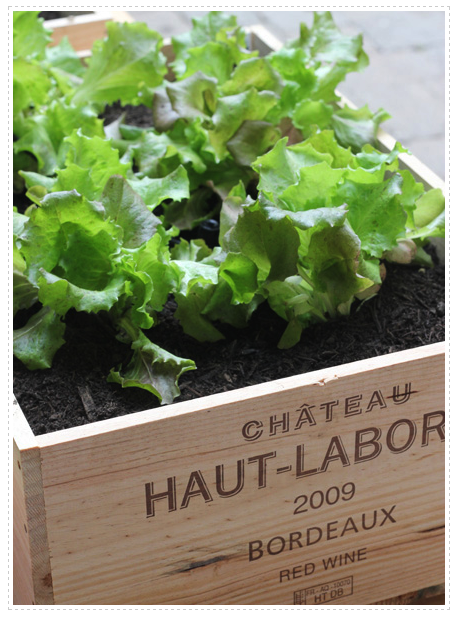 I’m inspired to find some wine boxes for a container garden like this one created by Linsey of LLH Designs. 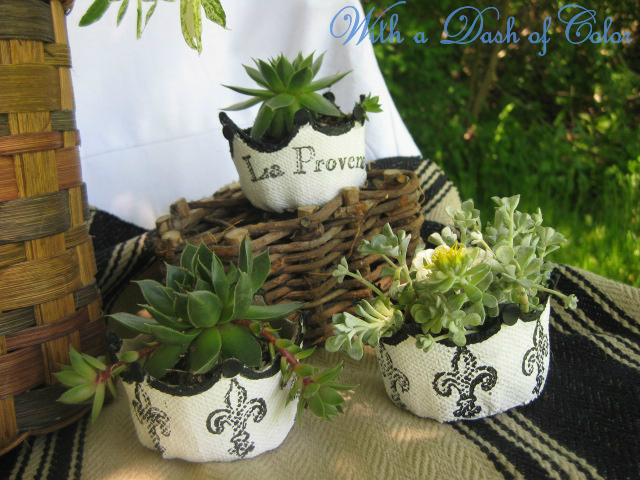 These French peat pots with succulents by With a Dash of Color make the perfect summer party favor or hostess gift. 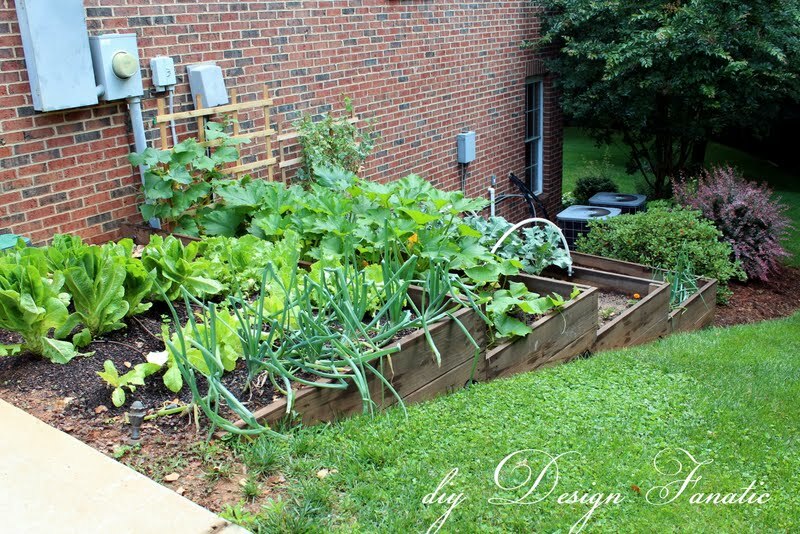 DIY Design Fanatic created this tiered garden and is now enjoying home-grown produce. 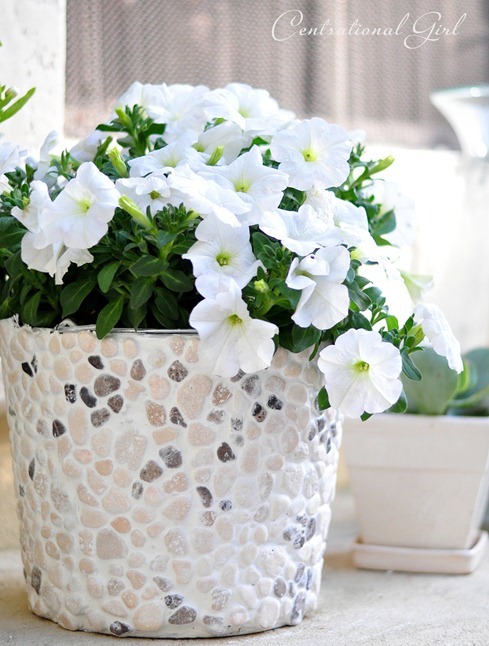 Plants always look better in beautiful pots and I adore this DIY rock covered bucket created by Centsational Girl. Don’t forget to check out all of the beautiful and clever garden projects that were linked up. Also, we’d love for you to join the Outdoor Extravaganza again tomorrow over at Amanda’s where you can link up your Outdoor Decorating Projects! If your project was featured, be sure to grab a button. See you at Amanda’s party! Such great ideas! I can’t wait to see what we all post for tomorrow! Looking forward to it as well! Of course! I think they are fantastic and may use them as favors for a summer party. Thanks again for stopping by!